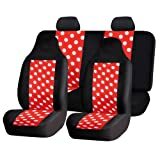 Add some fun to your vehicle with these quirky polka dot seat covers. Soft fabric with a middle 3mm foam padding makes these covers breathable to keep you feeling as cool as you look. • Sustains your automobile interior upholstery. • Adjustable straps helps installation, removal and reattachment . • One piece style front bucket seat covers, can be used with both non removable and removable headrest. • Durable stretchy fabric with opening pocket for storage. • Engineered to accommodate traditional and heated seats. • Semi-customized to fit most vehicles. • Material is breathable. Machine Wash and Air dry. This includes two (2) bucket seats and (1) rear solid bench and (2) headrest covers. Features: FH Group is a registered brand. For quality goods please ensure you are purchasing from FH Group only, do not fall for imposters. We cannot guarantee merchandise from other sellers to be as pictured and uphold the same quality.